Steven Spielberg is playing around with dinosaurs again. His new television show, which he's calling Terra Nova, puts him in the directors chair, and sounds like it might help us forget about The Land of The Lost entirely. 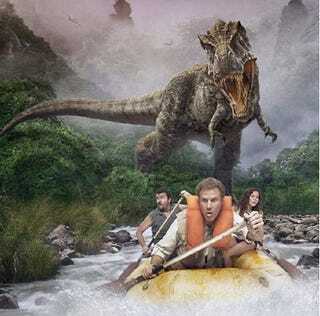 Following a family from 100 years in the future who travel back in time 150 million years to the strange and inhospitable environs of prehistoric Earth. Yes it is a little Land of The Lost-like, but it's on Fox, who have been really surprising us lately with current decisions regarding science fiction TV, such as Kurtzman and Orci three years to develop a new writing staff and new television. But this project promises to have such "elaborate FX" that rumor has it, "there's been talk of greenlighting it directly to series production rather than a pilot because it would be too expensive to shut down and start up again during the downtime between pilot and episodic production." Anything that puts Spielberg back into direct contact with dinosaurs has us, very happy.